Volkswagen Touareg Powertrain Performance Pros and Cons | Page 1 of 1 | Why Not This Car? What drives people to buy (or not buy) a certain car? 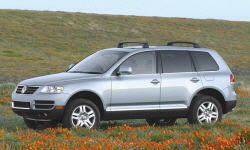 TrueDelta's members share Volkswagen Touareg pros and cons based on their real-world driving experiences. This car was chosen as it has a good performance base compared to other SUVs with similar engines. With lots of torque, the Touareg moves its bulk quickly, handling all ordinary driving situations effortlessly. It's fairly quick off the line, cruises at high speed easily, and overtakes on the highway rapidly. The V6 is not over powered with this heavy vehicle but with the 6 speed and gearing it is very lively and it can pull up to 7000 lbs.